Dr. Lukas Tamm, President of the Biophysical Society and Director of the Center for Membrane and Cell Physiology did just that, as part of a Biophysical Society effort to engage politicians in what we do. Dr. Tamm talked to the science people in the offices of Tim Kaine, Mark Warner, and Tom Garrett (as well as several others members of Congress). 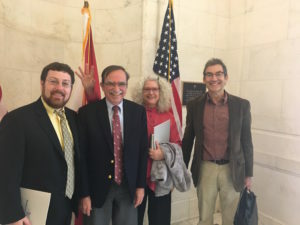 He impressed on them how important it is to have robust, sustained, and predictable science budgets if the US wants to keep its leadership position in scientific discoveries in the world. 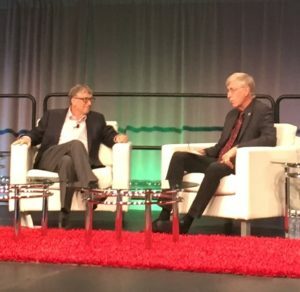 Bill Gates and Francis Collins at the Presential Symposium during 2017 ASHG Annual Meeting. Photo from FASEB.